While some detest broccoli because of its bitter taste, some might be fond of it, enjoying the green florets in their soups and salads. Whether you like it or not, it might be a valuable addition to your diet during pregnancy for the sake of your baby, as well as yours. Since it is high in essential nutrients such as folate and calcium, broccoli is one of the most beneficial food choices during pregnancy in its steamed, boiled or cooked form [1, 14]. Avoid eating broccoli raw in slaws and salads, as well as its sprouts, since they might lead to bacterial infections [5, 16, 17]. Studies have shown that folate plays an active role in preventing neural tube defects as well as other birth deformities like cleft palate, heart defects, and cleft lip . Certain findings have also highlighted the role of folate in lessening chances of preeclampsia . 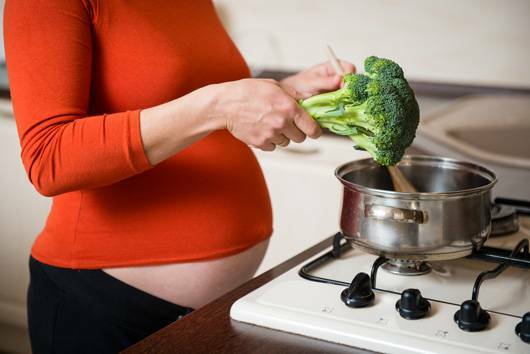 As a cup of cooked and chopped broccoli contains 42% of the daily value of folate, including it in the diet alongside other folate-rich food and supplements from early pregnancy would be beneficial for the mother-to-be . Apart from lessening risks of hypertension and preeclampsia during pregnancy, calcium also accounts for a proper fetal development by helping its heart, muscles, nerves, bone, and teeth to grow . Since a cup of cooked broccoli has 62.40 mg of the mineral, it falls in the list of calcium-rich foods for pregnant women [4, 5]. Besides folate, broccoli also contains a substantial amount of other vitamins like A, B1, B2, B3, B6, C, E, and K, that puts it on the list of foods eaten to maintain the overall health . Vitamins A and C facilitate in boosting the body’s immunity [4, 8, 9]. The B vitamins, on the other hand, fosters brain development in the baby (B1), also helping expectant mothers to maintain healthy eyes and skin (B2) as well as a sound digestive system (B3). B6 is significant in easing morning sickness and managing glucose levels [10, 11]. Constipation is a common problem during pregnancy as the increase in progesterone relaxes the muscles in the intestinal tract as well as the entire body, slowing the passage of food . Since broccoli is one of the fiber-rich foods , adding it to your curry or soup on a regular basis may be one of the measures you can take to combat constipation. Sautéed with baby corn, cauliflower, carrots and used in curries or salads. Prepared as soup with stilton cheese, peas, and vegetable stock . As juice along with beets, carrots or other fruits and vegetables . Even though it is a pregnancy superfood, giving in to your broccoli cravings might not be a good idea. Eating too much of it in one go or having it in large amounts every day may lead to side effects like gas or other stomach ailments. If you are troubled by an allergic reaction, bloating, or other gastrointestinal problems after having it, talk to your doctor at the earliest.